Successfully Added USB Fingerprint Security Lock Flash Disk (16GB) to your Shopping Cart. USB fingerprint security lock flash disk to encrypt and secure your files, folders, and computer with your fingerprint. Worried about prying eyes and nosy neighbors? Want to encrypt your files and render your whole computer inaccessible to unauthorized users? Wish you could carry your passwords on the tips of your fingers? This USB fingerprint security flash drive can meet all your data security needs. Using just your fingerprints and this handy USB Fingerprint Lock Flash Disk, your laptop and desktop will virtually be inaccessible to anyone other than yourself. 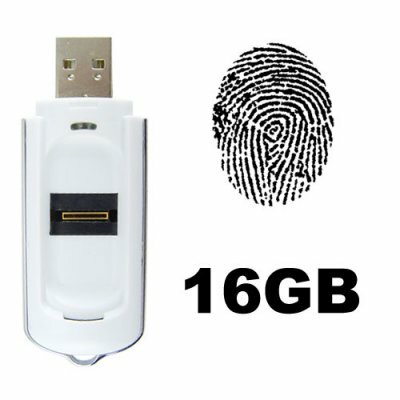 This compact and portable USB fingerprint lock flash disk has comprehensive security features, such as easy access to 8 GB's of secure data on the USB flash disk, encryption of files and folders on your computer with your fingerprint, and also enabling fingerprint login when you start your computer or return from a screen saver. The option to setup passwords as an alternative to fingerprints means you can always access your data, even if you forget to bring your USB security memory stick. Go to bed tonight knowing your top secret files are completely secured. This is a great resellers items and comes at a very low wholesale price from the leader in factory direct electronics Chinavasion. Do I need software to install it? The required software is contained inside the USB flash drive. What if I lose my USB security lock flash drive? You can establish a password to substitute for your fingerprints. I see the default setting is for 50% secure data and 50% unsecured on the USB flash drive, can this be changed? Yes, in Vista you can change the storage allocation as you see fit.